THE COLLEGE ARCHIVES ACQUIRED (the official term is accessioned) four scrapbooks today from the estate of Mary Irene Vujovich Ohlfs '46. Mary Irene, who passed away a decade ago, was a dedicated picture-taker and scrapbooker, and her son, Jeff, has been gradually handing off her Mount mementos. Scrapbook No. 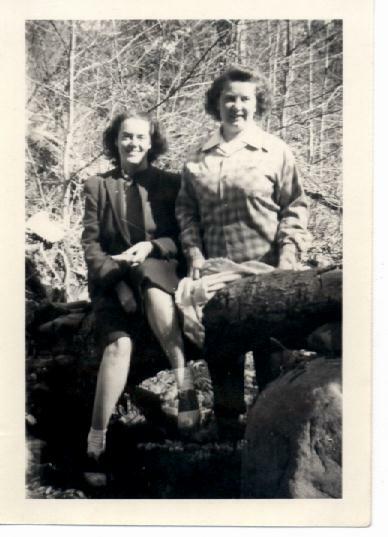 1 of today's acquisition also has an unexpected trove of photos of Mary Irene as a Mount student in 1942 or -43, posing and clowning with her sorority sisters in Tau Alpha Zeta (TAZ). Having seen innumerable pictures of my daughter and her CSUN sorority friends on Facebook, I'm struck by how some things don't change. Mary Irene was certainly the social networker of her day, in the media of handwritten notes, mimeographed invitations and a Kodak Instamatic. She would have loved Facebook. But you have to wonder what will become of the Class of 2012's digital "scrapbooks" on their Facebook pages. For example, the Mount's oldest sorority, Kappa Delta Chi (est. 1929), has a Facebook page with lots of photos not unlike Mary Irene's (although I'm sure the TAZ and KDX girls wouldn't be caught dead in each other's fashions).